The commercial wind industry was born in California, and the state has one of the strongest renewable energy incentive programs in the country. Still, when it comes to wind, Texas has us beat by a long shot, according to a new report from the Washington, D.C.-based American Wind Energy Association. California generates 5,829 megawatts of wind energy, compared with 12,354 megawatts in the Lone Star State. Iowa is a close third at 5,177 megawatts. At least one explanation is simple: Texas is a bigger and windier place. While California has pursued both wind and solar energy, Texas has focused on wind. 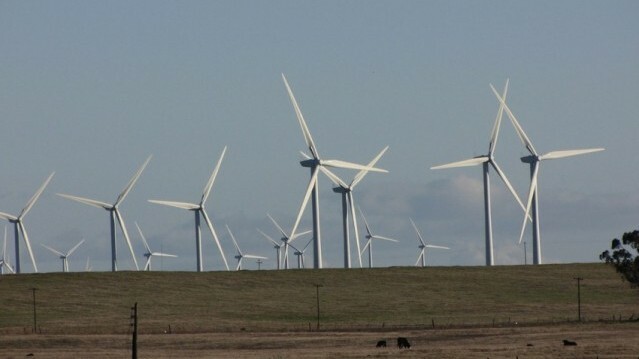 California currently gets seven percent of its electricity from wind, through turbines in Altamont Pass and the Tehachapis, among other places. But our remaining windy spots are harder to access. California’s wind industry has gotten a big boost from one of the most aggressive renewable energy policies in the country. Wind energy in the state has tripled since 2002, when the state set a goal to get a third of its electricity from renewable sources by 2020. Wind is still more expensive than non-renewable energy, says Wiser, so bringing more wind power online will require new government incentives. The state’s renewable energy goals “will need to be re-upped in order to stimulate additional demand for not only wind, but other renewable resources as well,” says Wiser. Rader says another hurdle has been convincing federal managers to open up land to wind development, particularly in the desert. And our own award-winning series on California's renewable power goals is here.